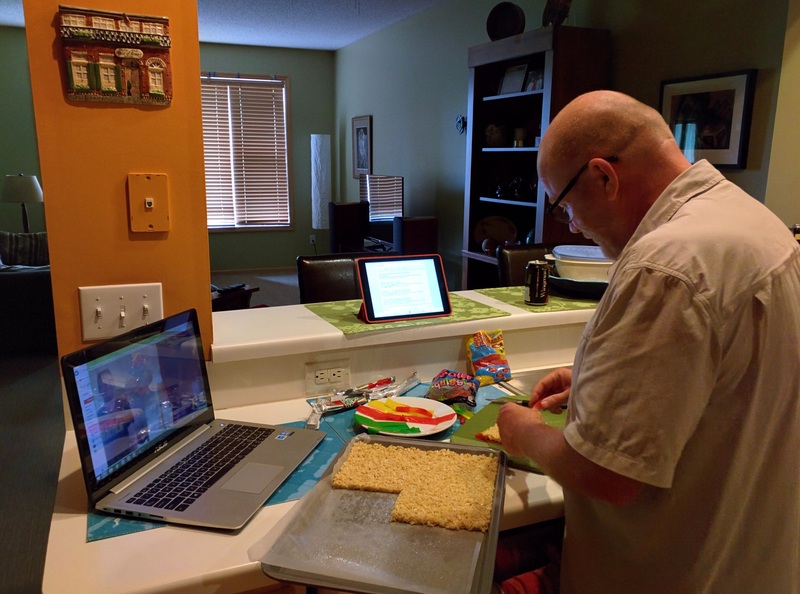 Elementary school principal exploring his passion for cooking using a different cookbook and new recipe each week! Recently, I’ve been engaged with other educators around the country through conversations on Twitter and Voxer about white space. There are many interpretations and applications for white space but for me it is time to slow down, reflect, learn, process, explore passions, and connect with myself. Cooking for me is white space time. I get to explore a passion, focus, be creative, think, reflect, slow down, try new things, and learn new things. Because of a busy October (travel to Washington DC, Halloween, and other commitments), I have been out of the kitchen for a few weeks and I missed that. 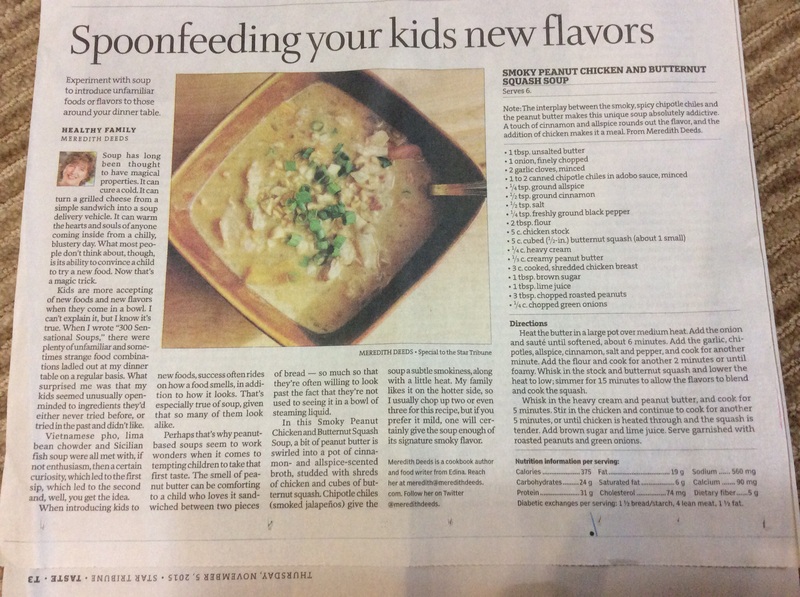 It’s still comfort food season here in Minnesota and I saw a recipe in the StarTribune Taste section that sounded delicious. 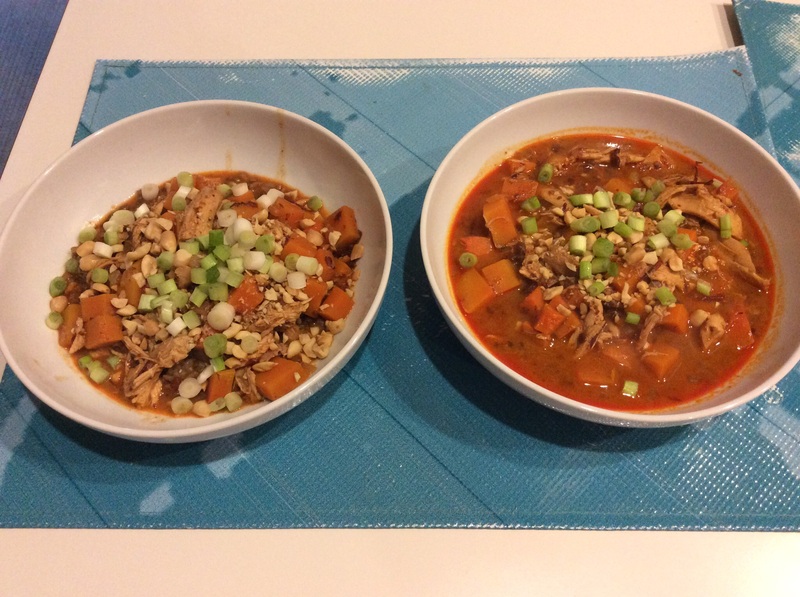 I was intrigued enough to make Smoky Peanut Chicken and Butternut Squash Soup. I took the chance to try something new, use a cooking tip I recently received, and take time for myself to engage in one of my passions. A few weeks ago I happened upon Knife Fest at a local shopping center. At one station I talked with a chef who was chopping butternut squash. He was using a knife I own and I explained how difficult It was for me to peel and chop the squash. He gave me some great tips: cut off the top and bottom of the squash; poke holes in it with a fork; and microwave it for three minutes. 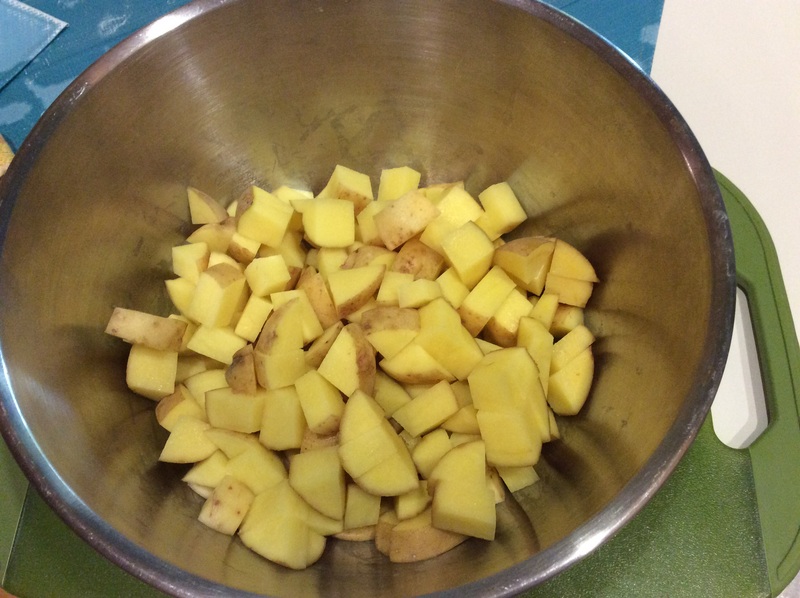 He said that after it cooled it would be easy to peel, cut, scoop out the seeds, and chop into cubes. He was right! I got to use those tips with this recipe and they worked! The recipe was ingredient heavy but easy. I already had everything in my pantry and refrigerator except for the chicken, onions, butternut squash, and canned chipotle chiles in adobo sauce. 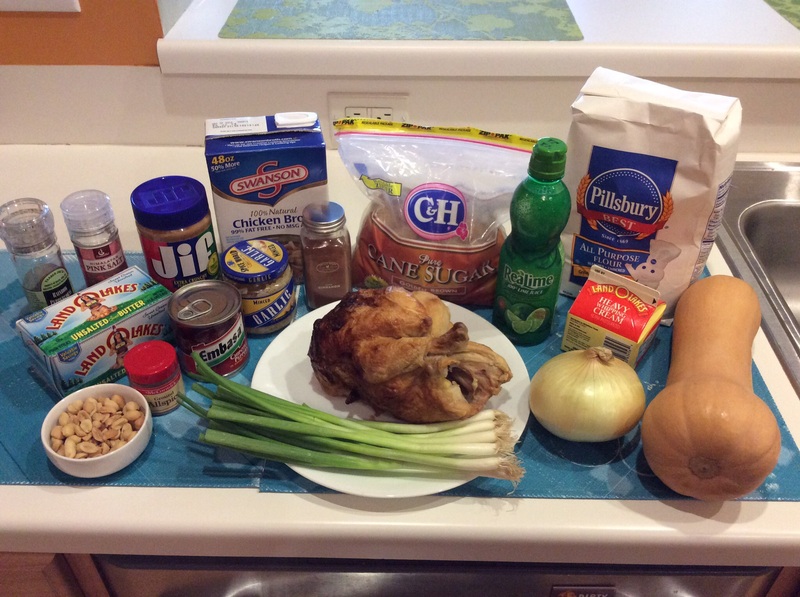 Another time saving tip is to buy a rotisserie chicken from your grocery store. Whoa! Did I ever learn a valuable lesson in how important it is to read recipes carefully. 1 to 2 canned chipotle chiles in adobo sauce does not equal 1 to 2 cans of chipotle chiles in adobo sauce. By not reading the recipe carefully, I made the soup eight times hotter than the recipe suggests. Good thing Kip loves spicy food, he thought it was delicious. For me, I served mine over rice to temper the heat. I’m going to make this soup again next weekend and use the correct amount of canned chipotle chiles in adobo sauce! White space is important for me to clear my head, rejuvenate, engage in some learning, think, reflect, and give myself time. I do that through long walks, bike rides, listening to music, and cooking. It’s a bonus for me that during my white space cooking time I get to try new things, build my confidence, reflect, think, learn, and create something delicious. How do you create white space for yourself? For my cooking challenge this past weekend, I wanted to stick with the comfort food theme (even though it was an unseasonably warm day, a record setting 85°). 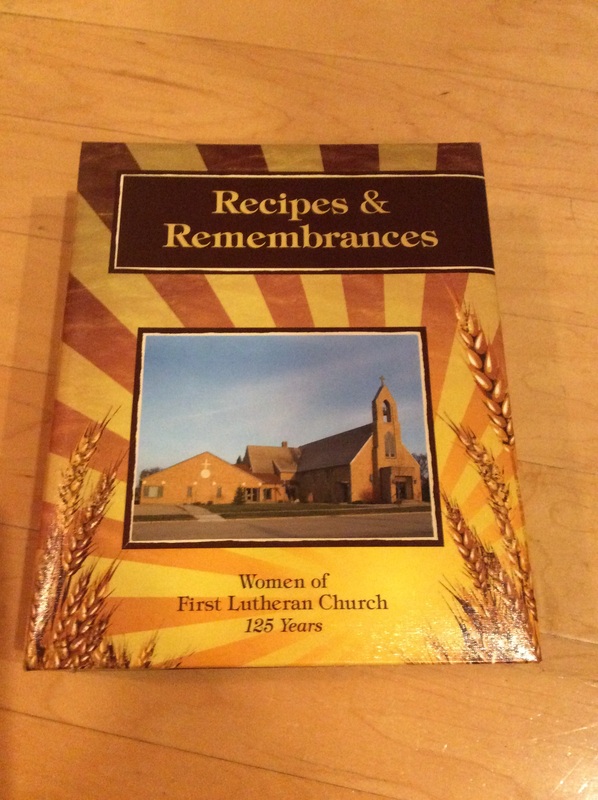 We grilled pork ribs and I grabbed one of my cookbooks, Recipes & Remembrances; Women of First Lutheran Church, Britton, South Dakota, 125 Years. This book was published in 2011 and was given to me by Kip’s mother, Marlene. 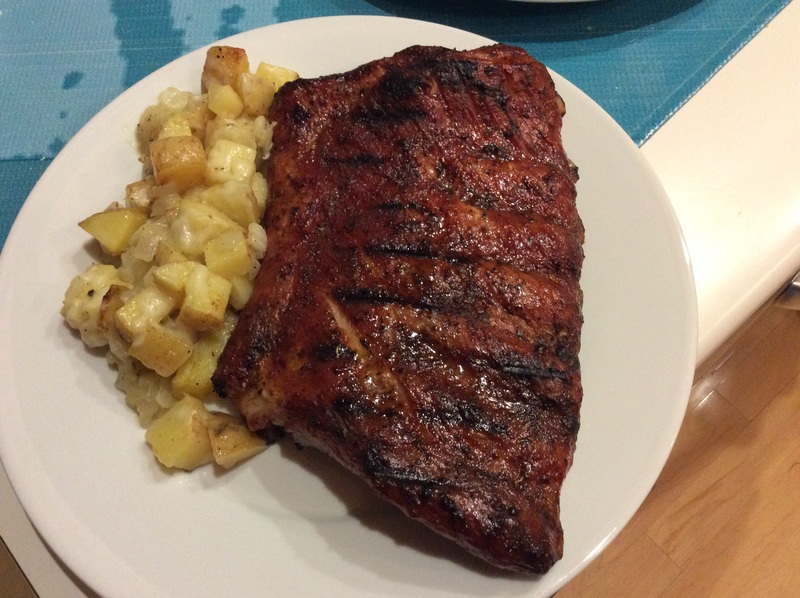 I wanted to find a recipe for a comfort food side dish that would go well with the ribs. 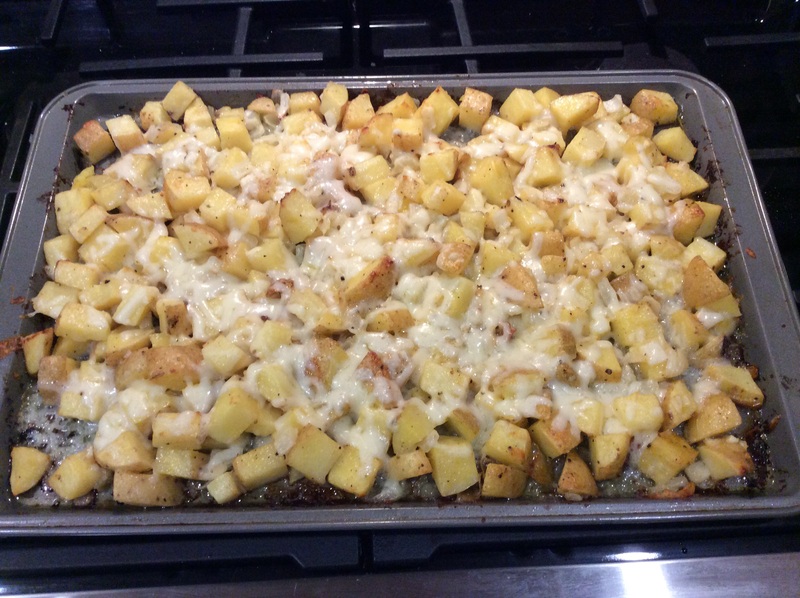 I was thinking scalloped potatoes but couldn’t find that so I landed on Swiss Cheese Potatoes. I decided to look up Marlene’s name in the index and there it was! She contributed eight recipes to this addition. Most were familiar to me as I have enjoyed those foods over the years: Crab Salad, Duck Breast, 24 Hour Cole Slaw, Depepe (Frog Eye) Salad, and Harvard Beets. But one recipe was very familiar, Sauerkraut Soup. That was a recipe I shared with Marlene that I crafted based on sauerkraut soup I enjoyed on a trip to Prague, Czech Republic. I was honored that she thought it worthy for inclusion in the First Lutheran Church Ladies’ Cookbook. A nice thing about church ladies’ recipes is they are generally simple and easy to follow. Not a lot of fancy items or a long list of ingredients. This held true for Swiss Cheese Potatoes. 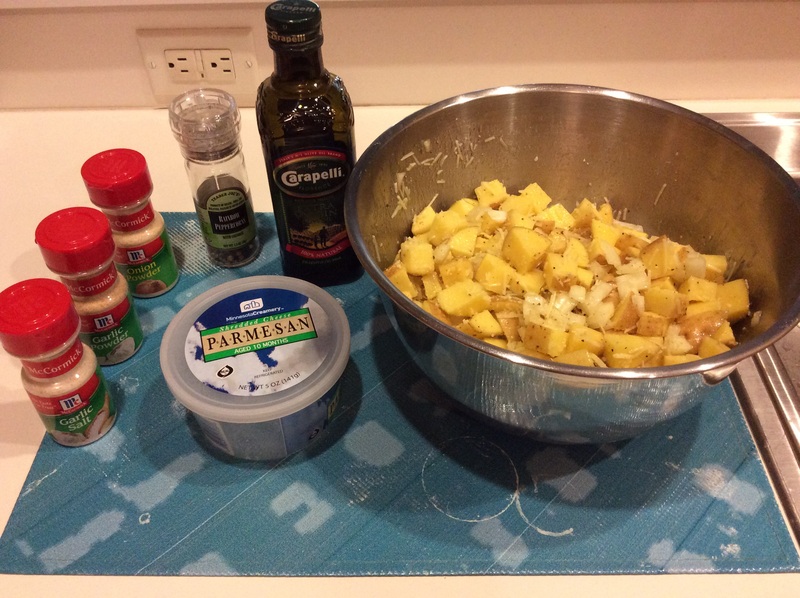 Add chopped onion, olive oil, garlic powder, garlic salt, onion powder, salt, pepper, Parmesan cheese and mix. 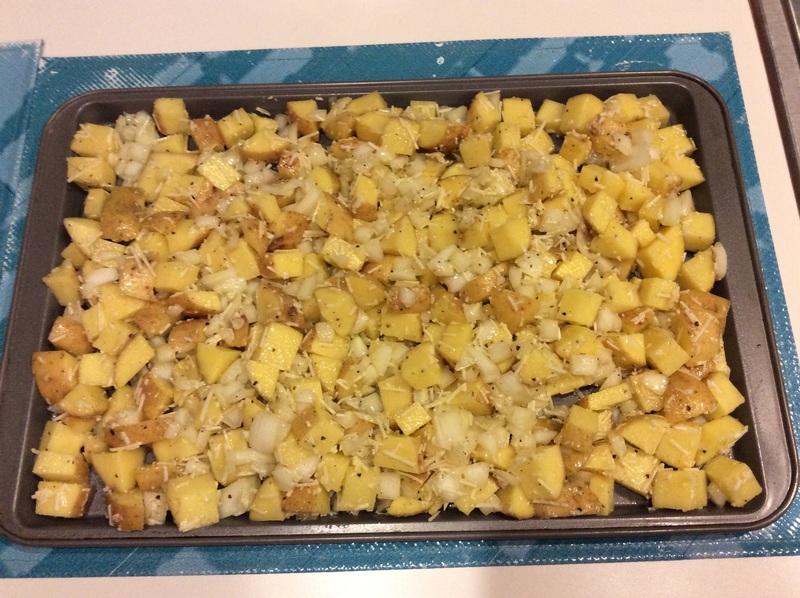 Place on prepared baking sheet and bake for 45 minutes at 375°. Top with Swiss cheese during the last few minutes. 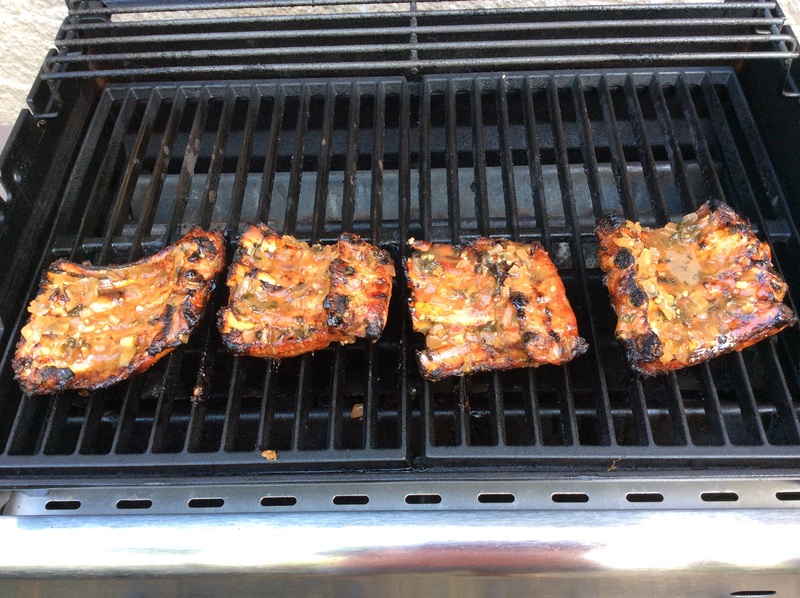 Get your husband to grill the ribs to perfection. 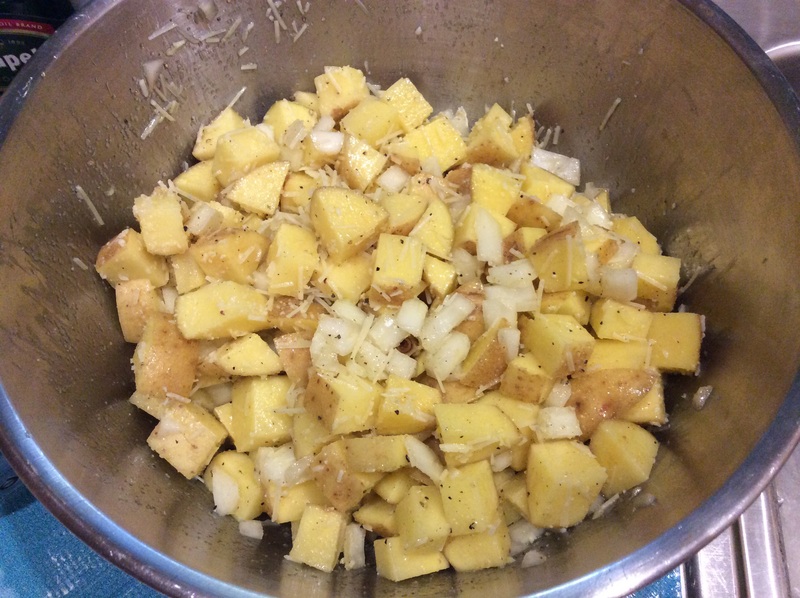 And you have an easy and delicious side dish to accompany your ribs. Oh, and it didn’t hurt that this day we hit a record setting 85° possibly being the last warm day of our grilling season. So, dig out that church ladies’ cookbook your grandmother or auntie gave you and give it a chance! 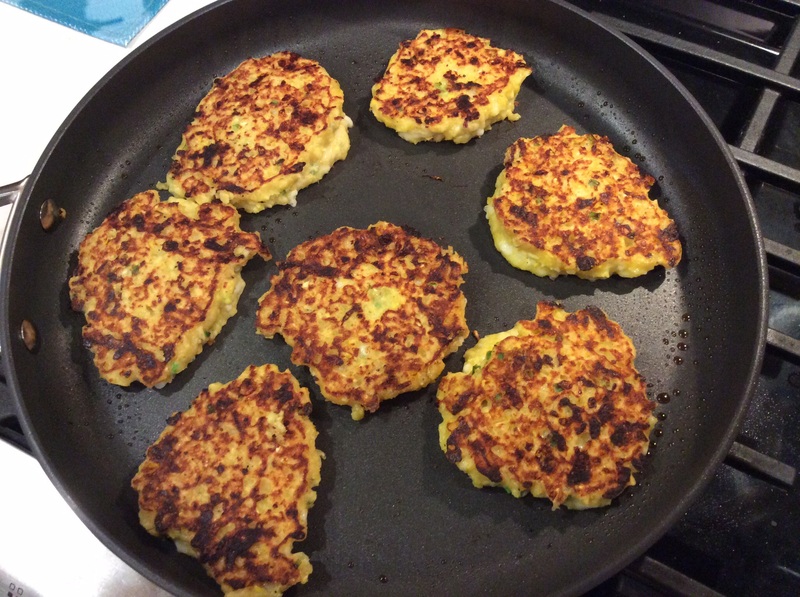 When Life Gives You Sweet Corn, Make Fresh Corn Cakes! 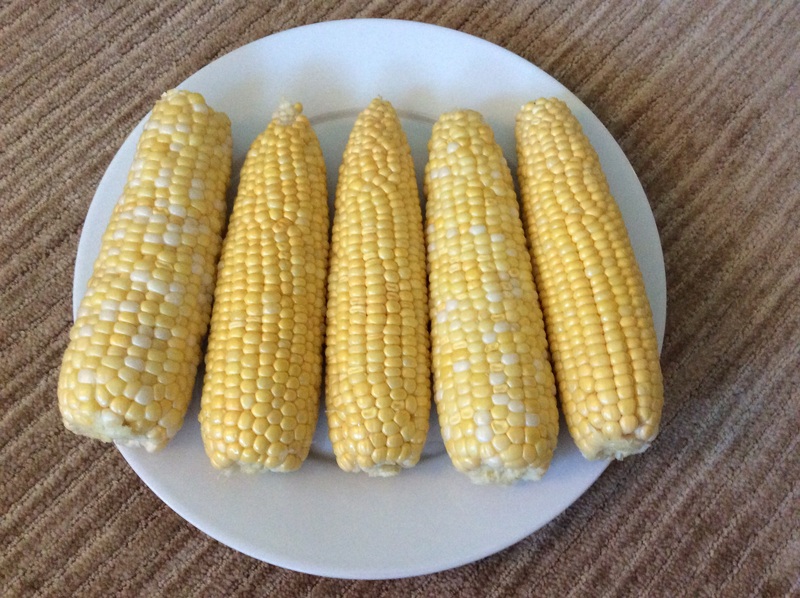 Kip came home from a trip to South Dakota to visit his family with two dozen ears of fresh sweet corn from a field in his home county in northeastern South Dakota. 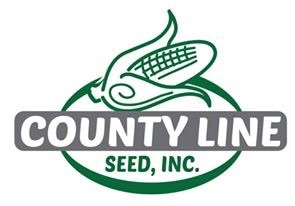 One of Kip’s nephews owns County Line Seeds, Inc. in Langford, South Dakota. He specializes in seed and seed treatment along with updating or overhauling seed planters. We received the corn from Kip’s nephew, the corn seed dealer. It was a great growing season in South Dakota allowing farmers to plant later thus some corn was harvested at the end of September. Good for us! Because my fall theme is comfort food, I diverted from my cookbook collection and conducted a Google search for “corn comfort food”. 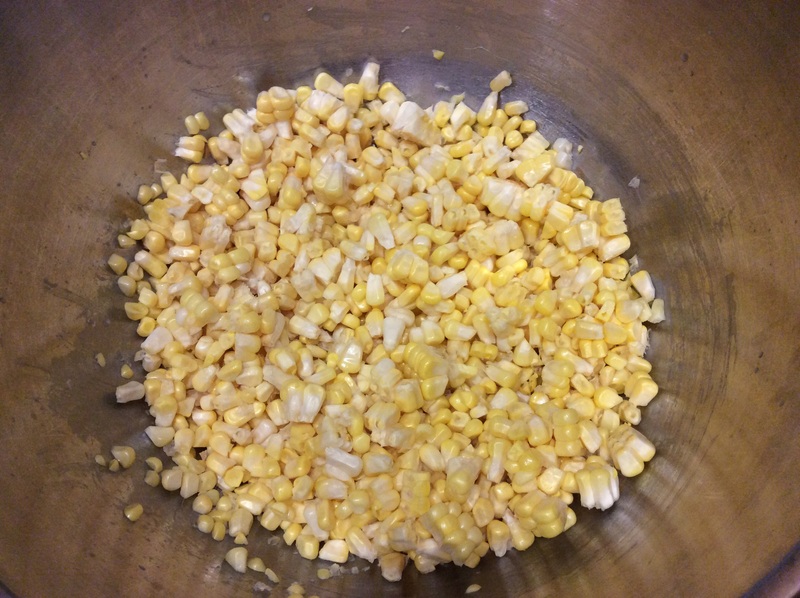 Up popped recipes for corn chowder, corn pudding, and bacon-cheddar corn muffins. 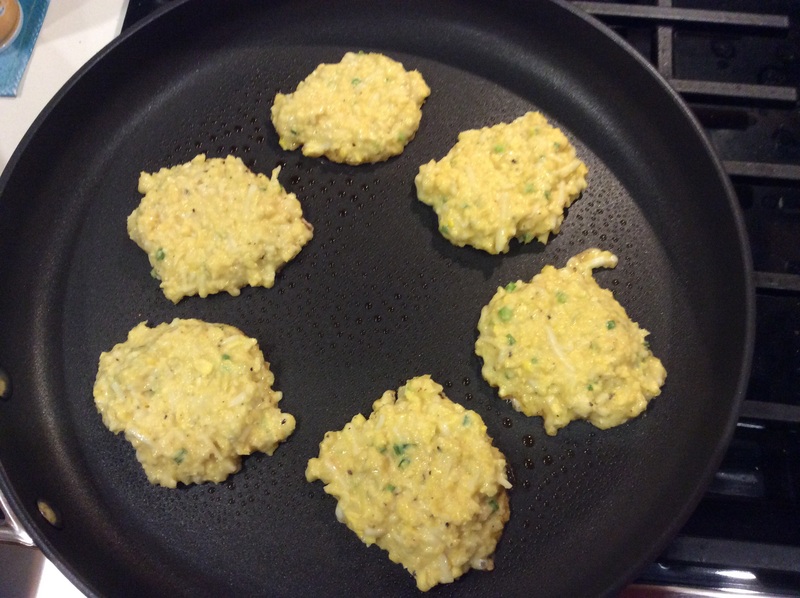 Those all sounded delicious but I settled on a recipe from the Southern Living website, Fresh Corn Cakes. Not being a southerner, I had never heard of corn cakes. It’s not something our family made or I grew up eating. 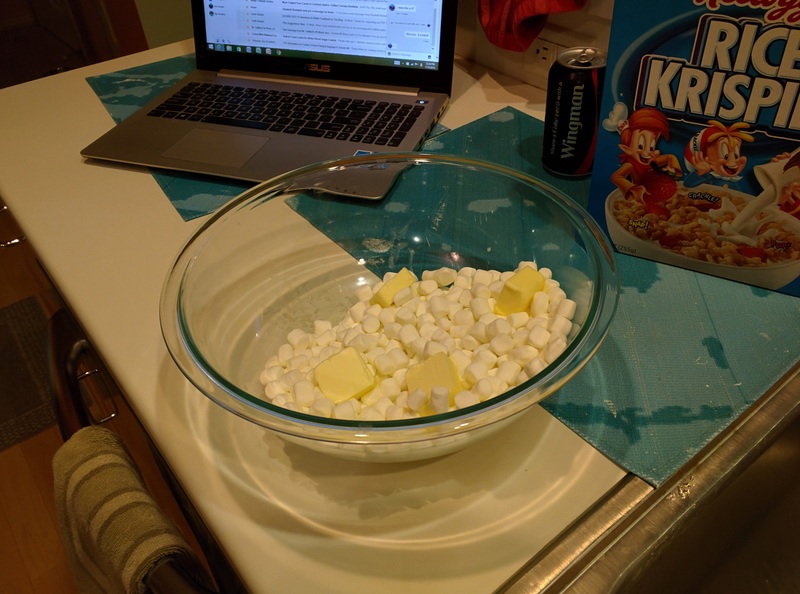 The recipe looked easy, only four steps! 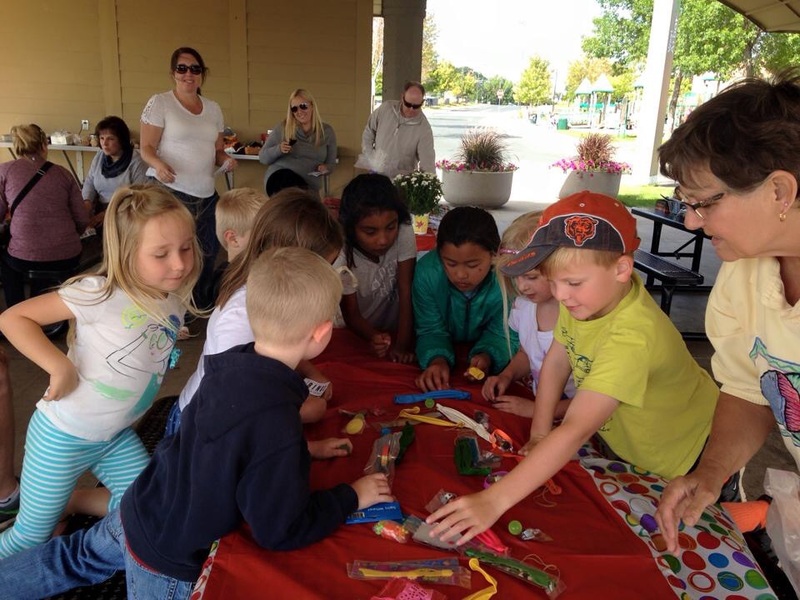 The first step was food processing the fresh corn kernels, milk, eggs, and butter. 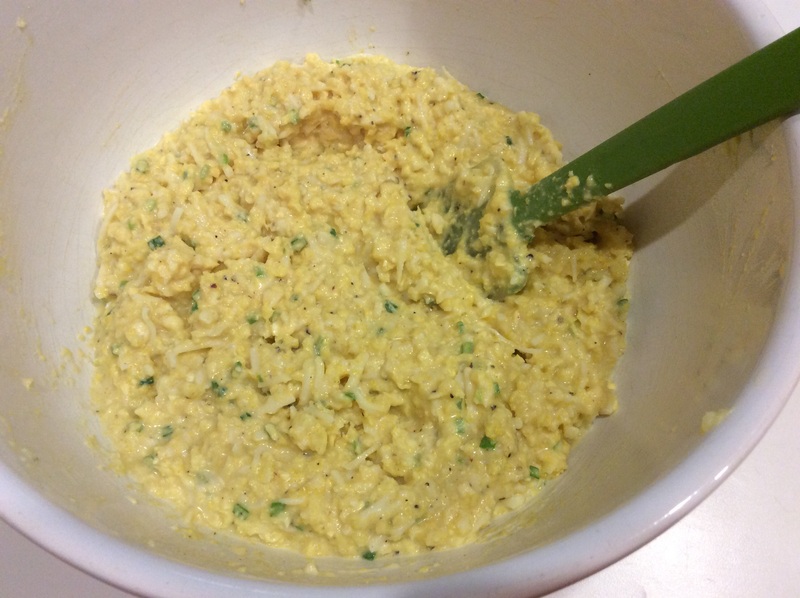 Second step was mixing the other ingredients: flour, corn meal, mozzarella cheese, chopped chives, salt, and pepper. Step three was adding the corn mixture to the other ingredients. The final step was cooking the cakes on a hot, flat pan. For a first time effort, the corn cakes turned out well. We had them as a side to steaks we grilled. The recipe made a lot of cakes, too many for two of us to eat at one meal! Since we couldn’t eat all of them at dinner we finished them at breakfast the next morning covered in maple syrup! 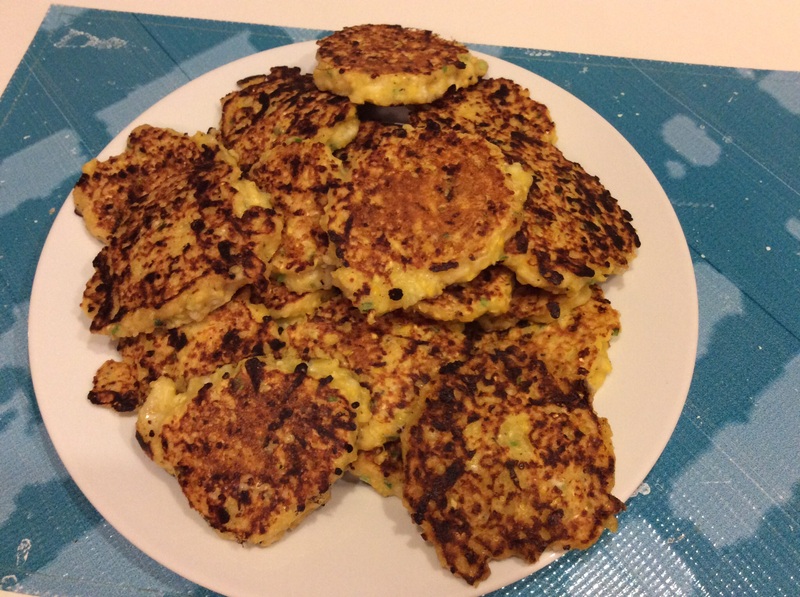 So, when life gives you sweet corn, make fresh corn cakes! 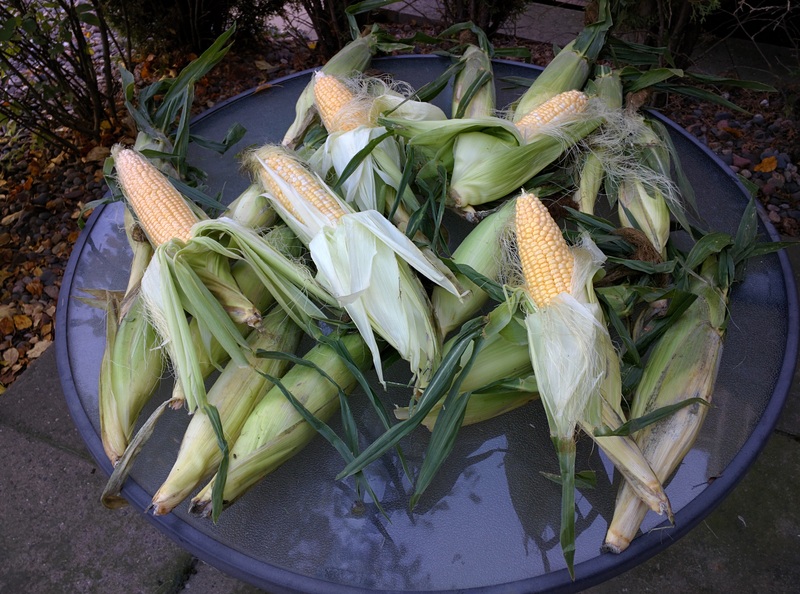 Now, I’ve got to figure out what to do with the remaining ears of corn. Maybe it’s time for corn chowder, corn pudding, or bacon-cheddar corn muffins! It was the first weekend of Fall and I’m beginning a seasonal series on comfort foods. I’ll explore comfort foods from my childhood, tastes I’ve acquired as I’ve gotten older, taking familiar comfort foods and working to make them healthier to help manage my diabetes, and comfort foods of various cultures (I’m going to tackle one of my favorite comfort foods later this Fall, Vietnamese Pho). 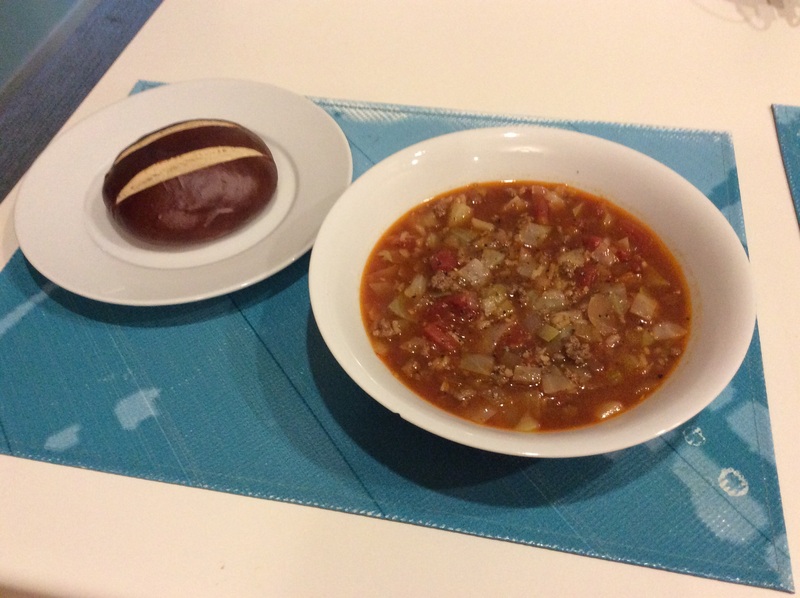 This weekend it was a twist on a comfort food favorite, stuffed cabbage rolls, turning it into stuffed cabbage soup. 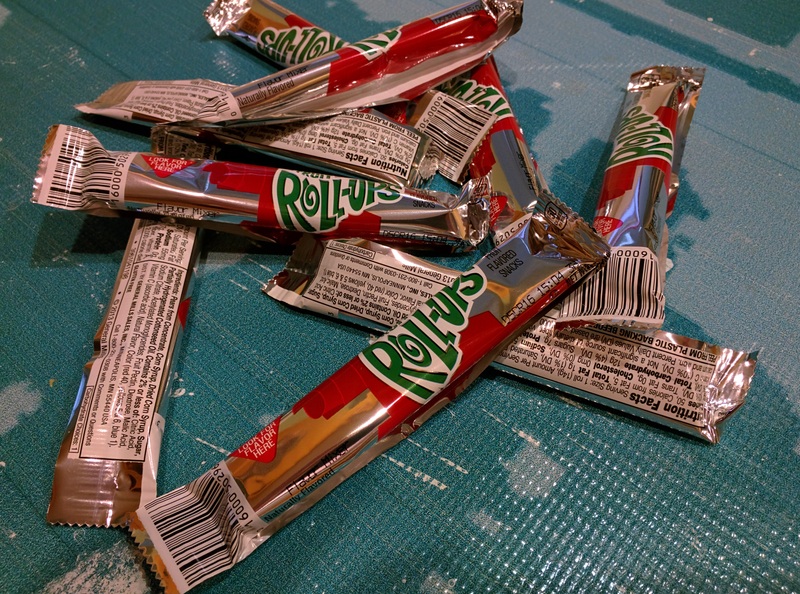 I grew up calling them Golumpkis, the Polish word for cabbage rolls. Cabbage rolls are common in Slovak, Hungarian, Ukranian, Russian, Lithuanian, German, Swedish, and Yiddish cuisines. Some of you may know these cabbage rolls as pigs in a blanket. To me, pigs in a blanket are little wieners rolled in crescent roll dough and baked, but I’ll save those for a later post! The recipe included the same ingredients you would use for making stuffed cabbage rolls: ground beef, white onion, garlic, sweet paprika, thyme, petite diced tomatoes, tomato sauce, beef broth, green cabbage, brown rice, salt, and pepper. Another nice thing about this recipe is it only used one soup pot! The recipe called for no-salt tomato sauce and salt-free beef broth so without adding your own salt and pepper, it might taste too bland. This dish also allowed me to read and learn more about onions. The recipe called for a white onion, something I hadn’t used in a long time. I’ve recently used green, yellow, and red onions but not white so that gave me a chance to do some research and reading. White onions have a milder taste and don’t keep as long as other types of onions. You do have to like cabbage to enjoy this soup but you also need to like cabbage to enjoy stuffed cabbage rolls! 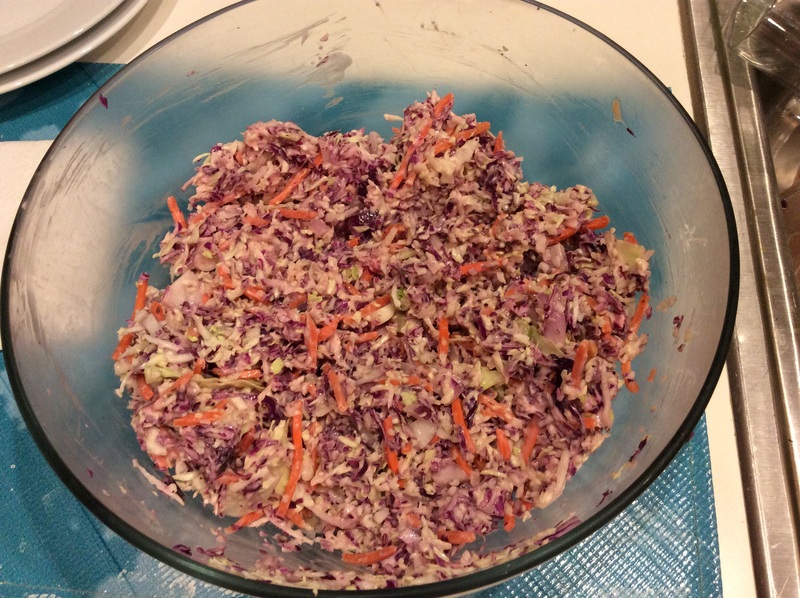 I am a cabbage lover who enjoys coleslaws, red cabbage in chopped salads, and sauerkraut! 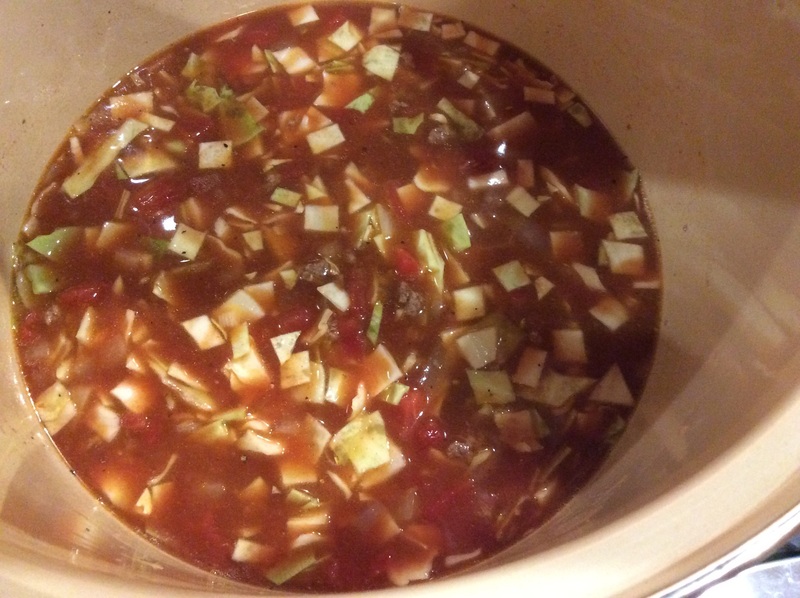 I’ll be adding this soup to my comfort food rotation because it is quick, easy, and tasty. It only took an hour from start to finish, something that could be made on a week night. The most difficult thing was chopping one white onion and four cups of green cabbage. Plus the bonus of easy clean up makes this soup a winner! Kip appreciates easy clean up because when I cook, he cleans! 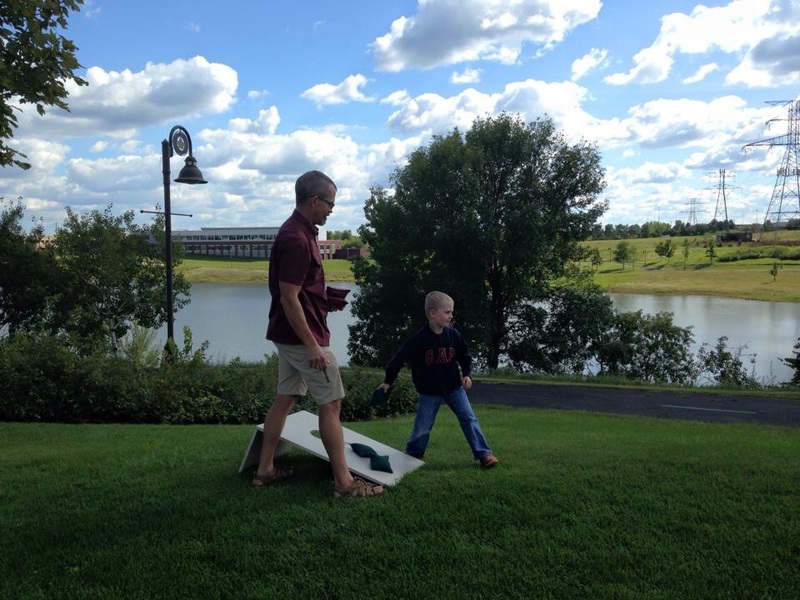 Yesterday, we hosted the First Annual Rice Lake Staff and their Family Members’ Picnic. 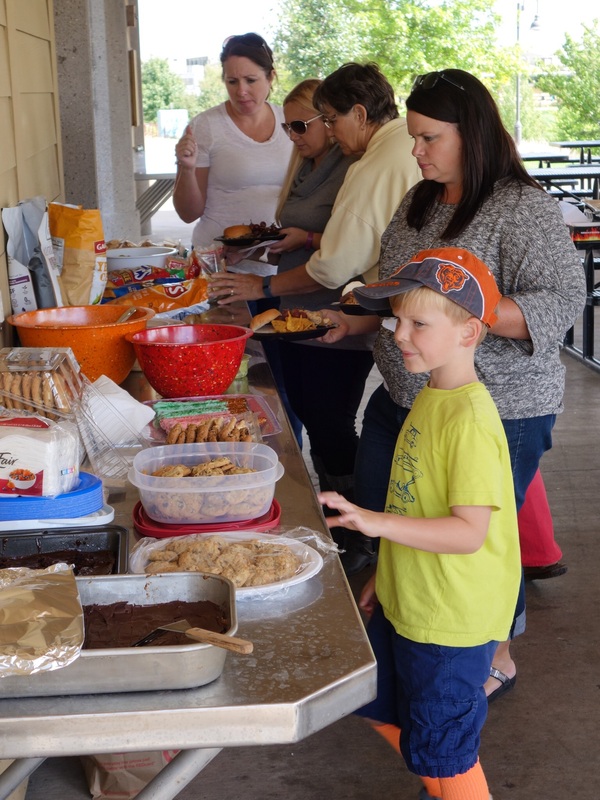 45 adults and kids enjoyed spectacular weather, games, socializing, and a delicious catered barbecue with creamy coleslaw, mustard potato salad, smoked pulled chicken, beef brisket, and desserts! While I didn’t do any of the cooking, one theme of Principal Who Cooks is still relevant; food brings people together. I organized this first event for a number of reasons. 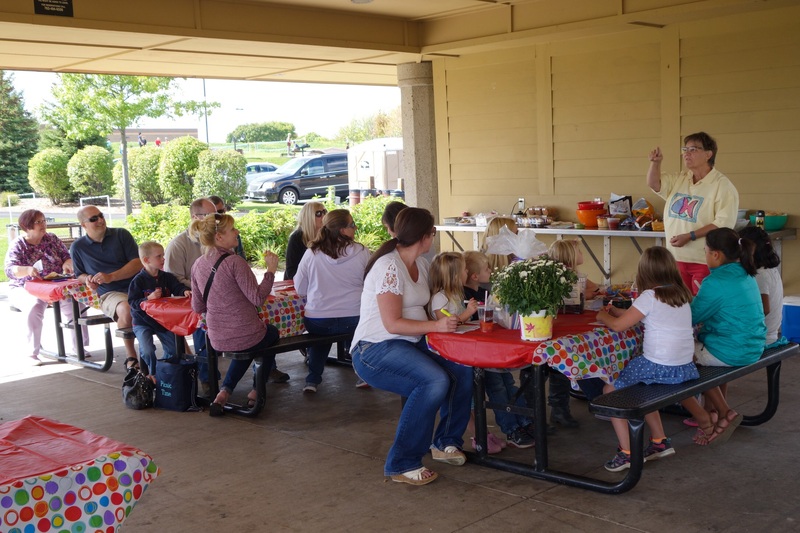 Our staff needed time to check in with each other after summer break and a successful start to the new school year; we needed to meet and reconnect with spouses and children that we hear about at school and see on social media; and we needed some fun! We all have busy work and family lives and when we can connect the two, it strengthens relationships, builds trust, and puts things in perspective. It was fun to watch my staff members and their small kids, hear about staff members’ older children, and catch up on summer adventures. 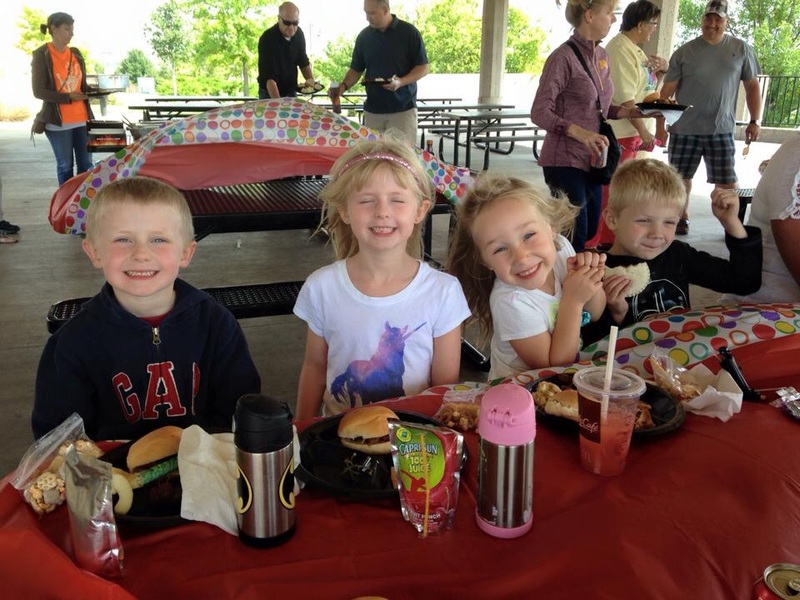 And, having all this happen while enjoying a great picnic was a bonus! 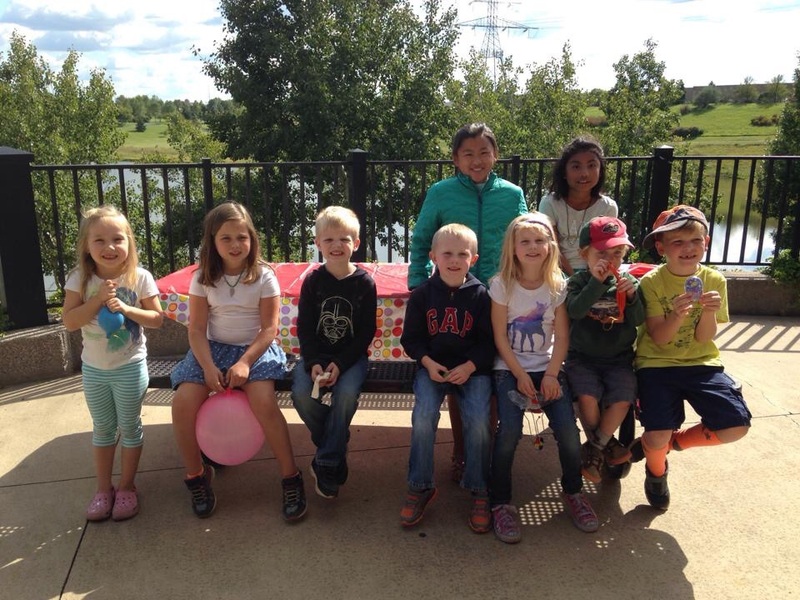 I’m hoping this becomes an annual event so, Rice Lake Roadrunners, save the afternoon of the first Saturday after the first week of school in September 2016 for the Second Annual Rice Lake Staff and their Family Members’ Picnic! Many times I look at a recipe and think, “all those ingredients are too cumbersome” or “that’s going to take too long.” That’s why I love cooking on weekends; I have plenty of time for gathering ingredients, shopping, prepping, and cooking. Cooking for me is cathartic, it relaxes me, and gets my creative juices flowing. I had been looking at a recipe in a magazine published by our local grocery store for awhile. Actually, I’d been reading it since June thinking it’s too complicated, it’s going to take too long on the grill, and I don’t have all the ingredients. Today was a perfect day to conquer my negative self-talk. I had time to do the shopping, had all day to marinade the ribs, and the 90° plus heat made grilling outside easier and more comfortable than cooking inside. I discovered I already had most of the ingredients, I just needed to get the vegetables and baby-back pork ribs from the store. 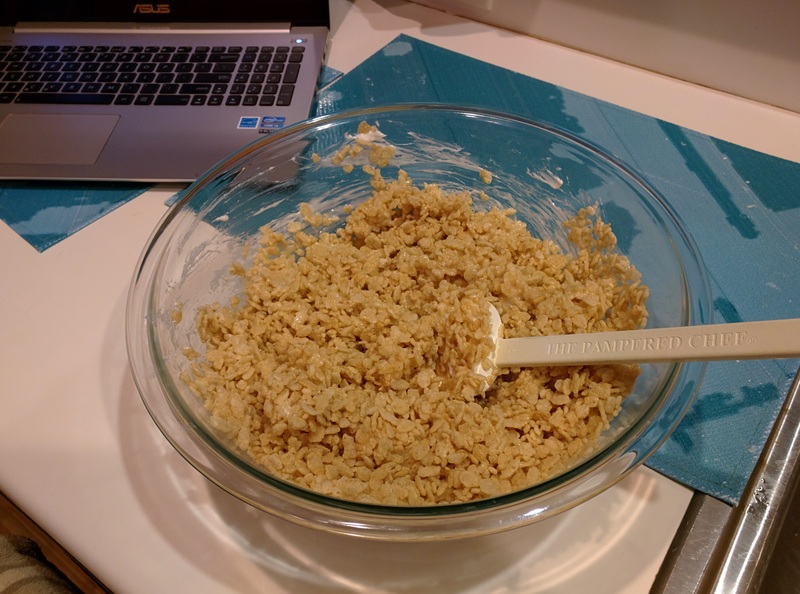 The recipe also provided another challenge to overcome. The marinade called for Chinese five spice powder which I couldn’t find anywhere at the store. Luckily, a quick Google search informed me the five spices were Cinnamon, Cloves, Fennel, Pepper, and Anise, all of which I knew I had at home except Anise, which I now own. 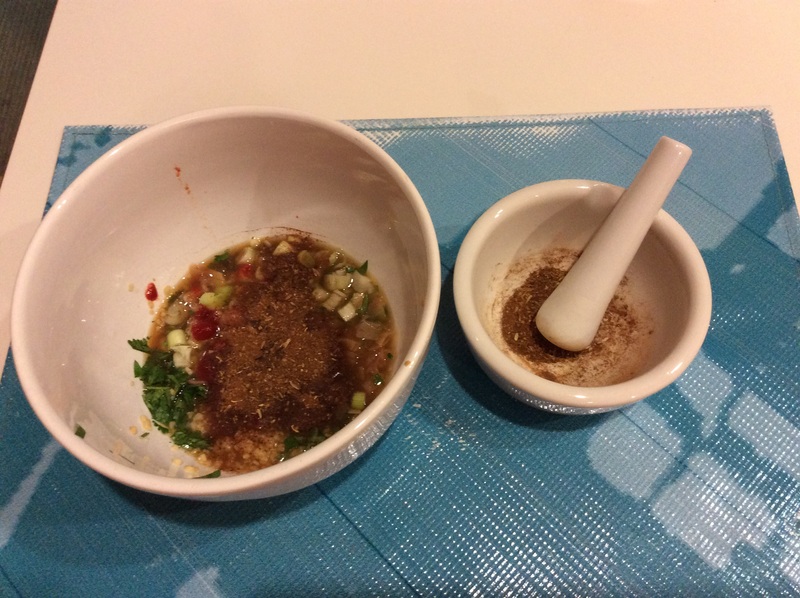 And, with my mortar and pestle, I was able to make my own spice mixture. The most difficult thing was preparing the marinade. 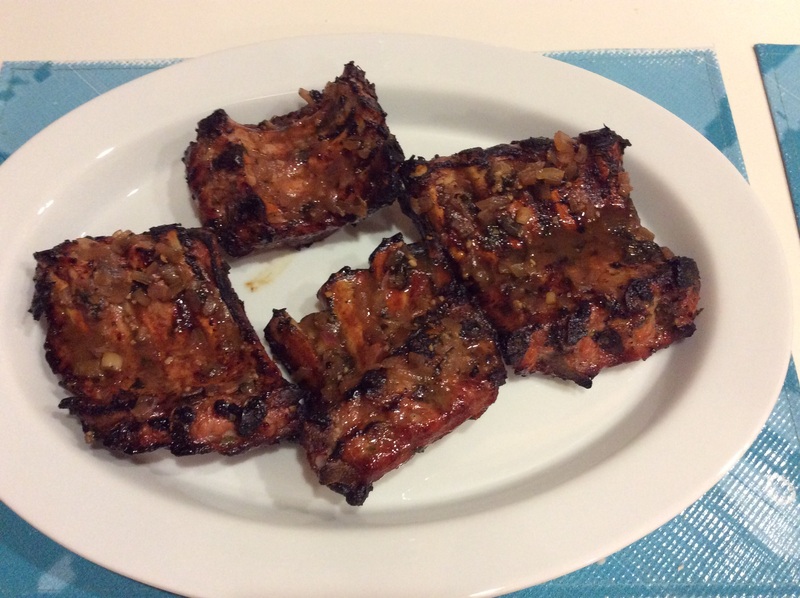 Yes, it was ingredient heavy (12 ingredients) but when it was completed and the ribs were marinating in the refrigerator, most of the work for dinner was done. The next work was six hours later. Kip got the grill ready to cook the ribs at 350° for ninety minutes while I prepared the glaze, which was easy because besides peanut oil and onion, it included the already prepared leftover marinade! The recipe was very good about describing the proper grilling techniques. 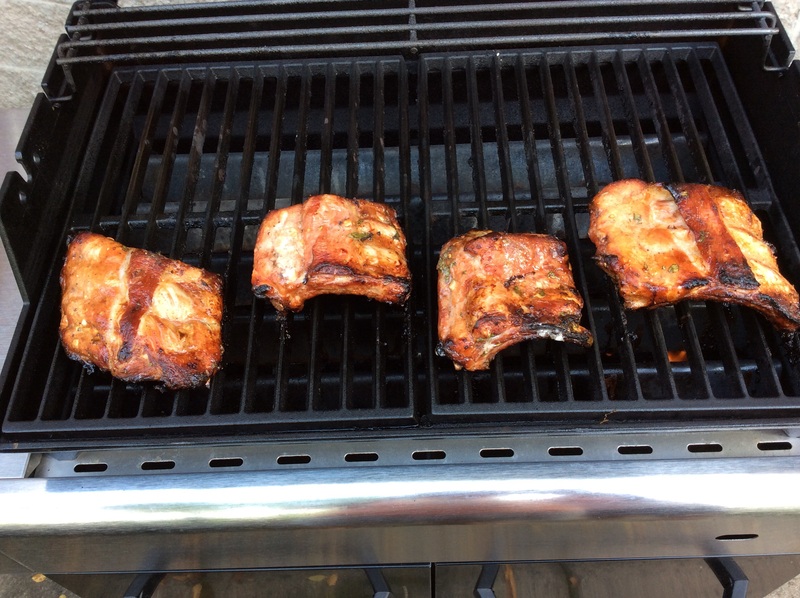 We were able to grill the ribs for ninety minutes over indirect heat on our gas grill at 350°. 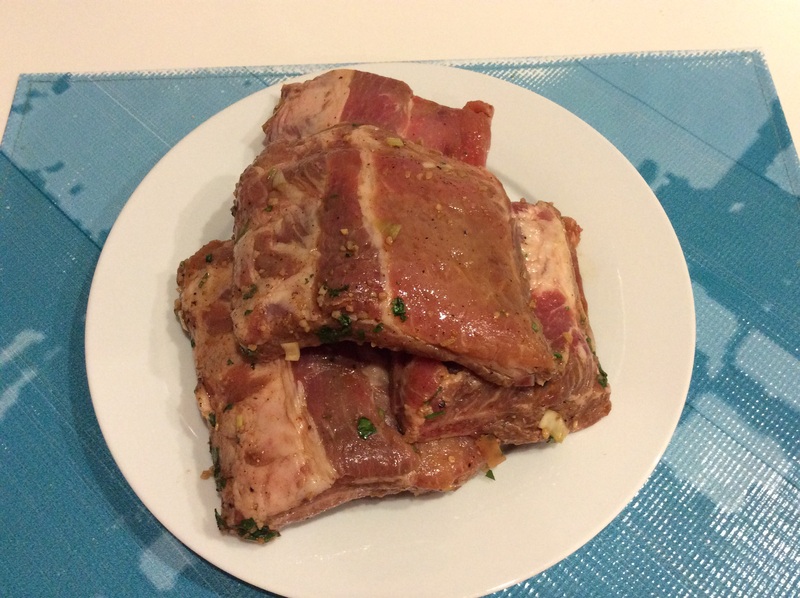 The recipe was specific about glazing the ribs during the final six minutes and letting the ribs sit for 10 minutes under loose fitting foil. 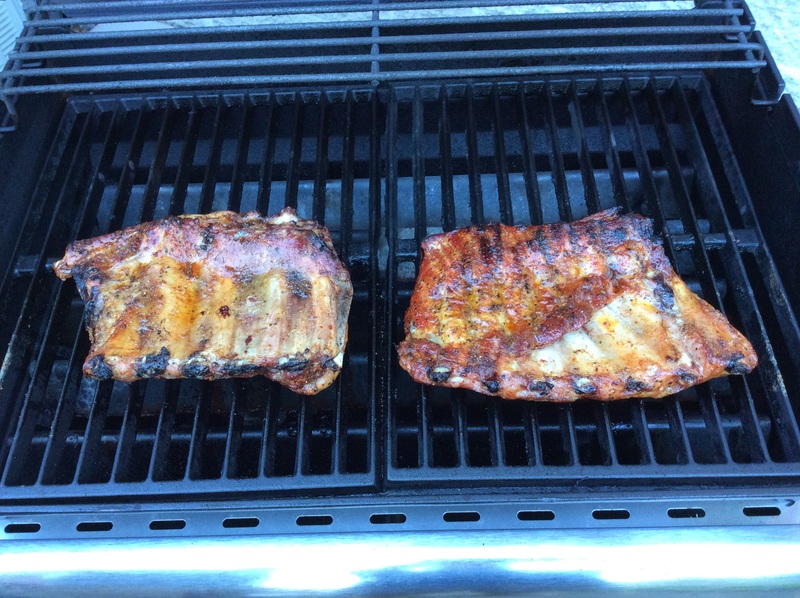 Those specific directions helped me overcome negative self-talk since I’d never grilled ribs before. 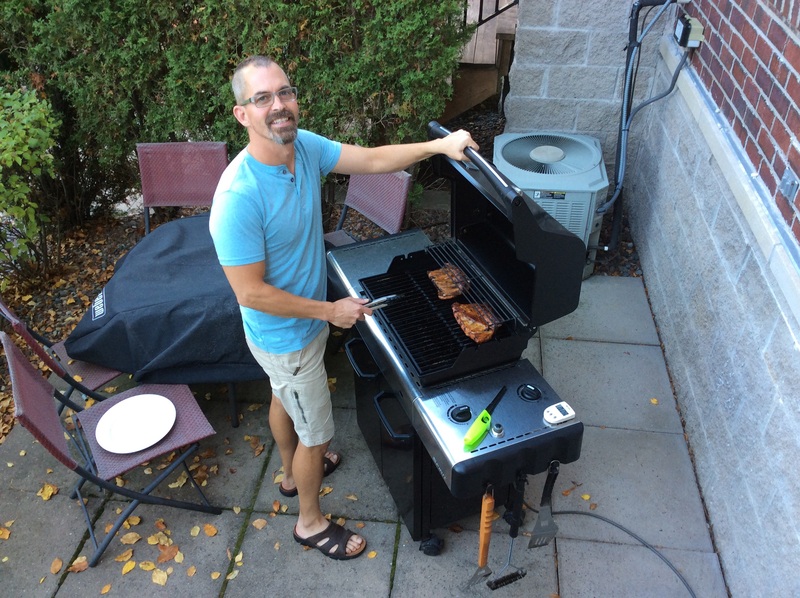 Some of the reasons were I never knew the grilling temperature, length of time, and clues to look for (meat pulling away from the bone, thanks to the descriptive recipe). I don’t mean to brag, but the ribs were delicious! Perfectly cooked thanks to the recipe directions. The marinade and glaze were amazing; a little kick (thank you Sriracha chili sauce) but not too much for my sensitive taste. 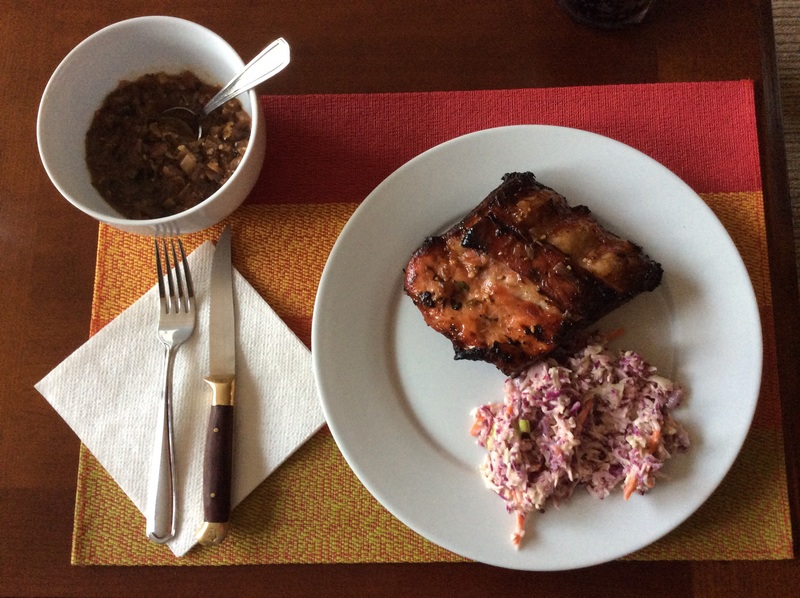 Another nice feature of the magazine article and recipe was the inclusion of an Asian inspired coleslaw that paired nicely with the ribs. So, the next time negative self-talk starts to prevent you from trying something new, take a deep breath, think carefully, and plan some time to overcome that talk. 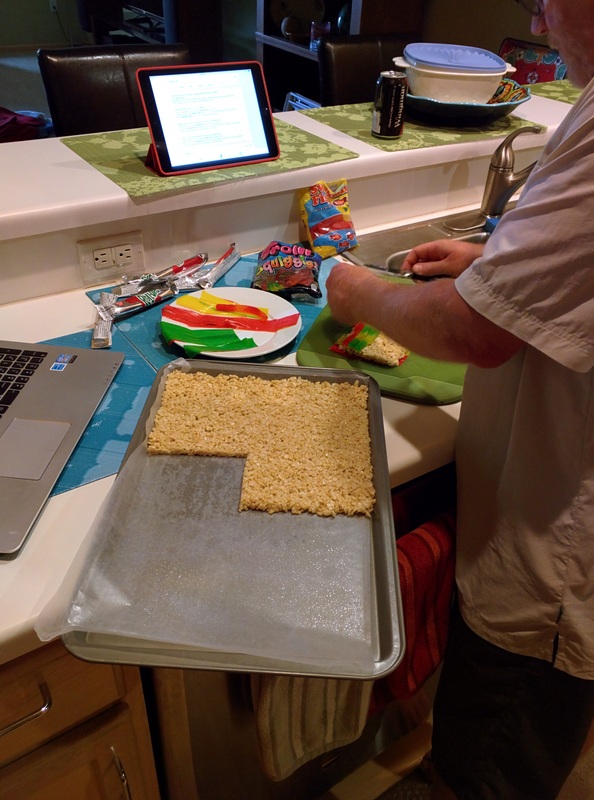 You will find the end result is much better (and delicious) than first imagined. 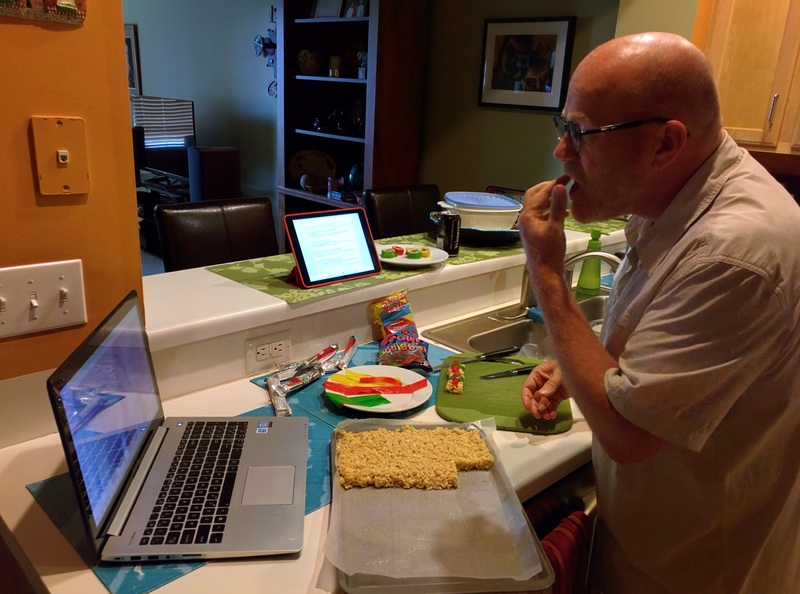 In February, I blogged about making sushi with Kip. Jon Harper, a principal from Maryland who has an awesome blog, showed that to his nine year old daughter, Bailey. She responded that my post reminded her of a video she saw about someone making candy sushi. 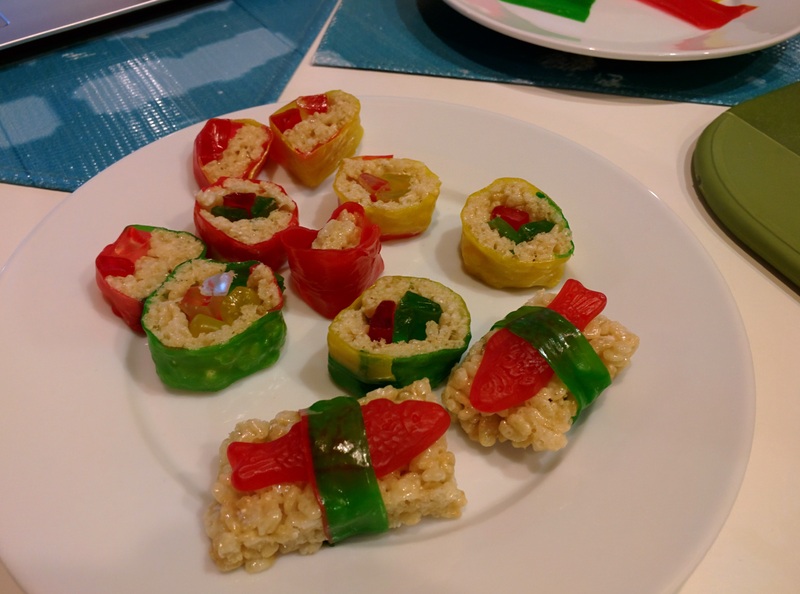 We made a plan to make candy sushi in the summer. 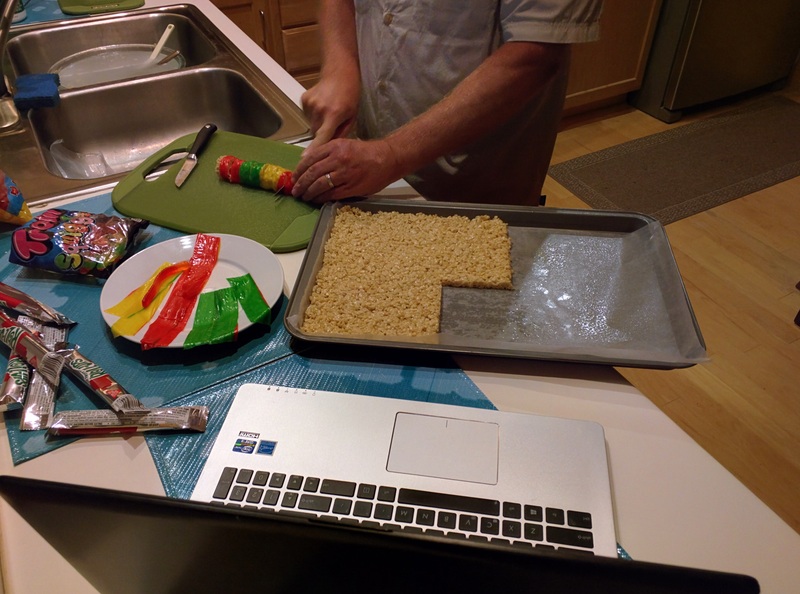 After communicating for a few months, today Bailey taught me how to make candy sushi using RIce Krispie treats, Gummi Worms, Swedish Fish and fruit roll-ups. 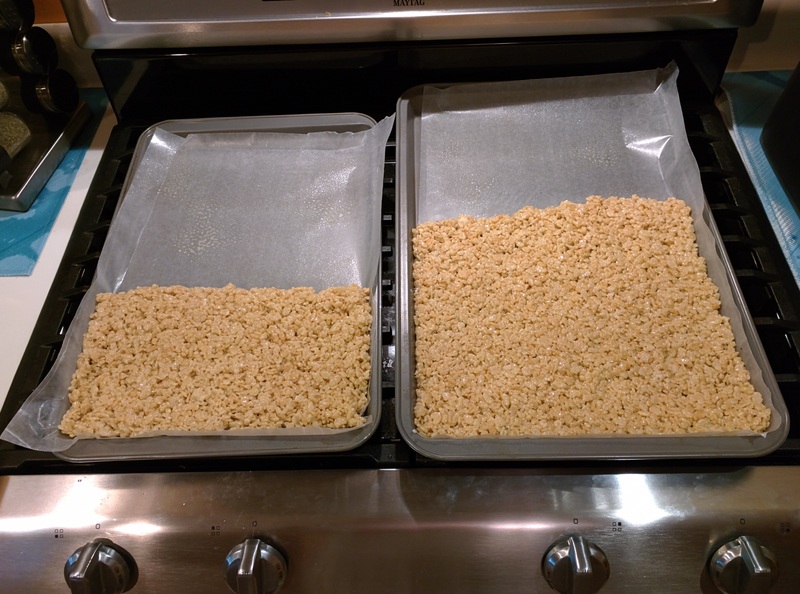 Thanks to Bailey, I made Rice Krispie bars for the first time. 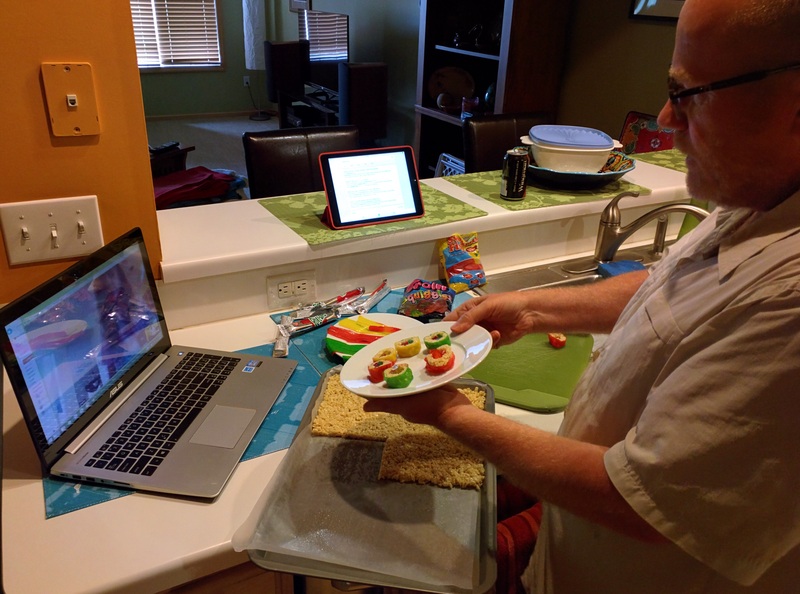 Her dad and I connect on Twitter and Voxer and today Bailey and I interacted through GHO (Google Hangout) where I got to see her creations, listen to and watch her walk me through the steps of making the candy sushi and interact in real time. It was a great experience to connect and share our passion for cooking. 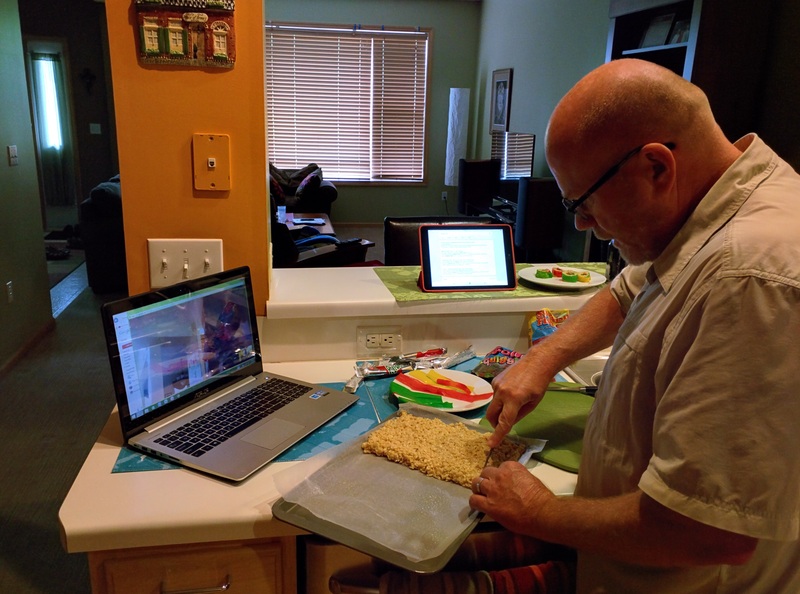 This is not only a fun example of connecting on a new cooking adventure but is also an example of authentic learning, sharing your passion and it demonstrates the power of a PLN (Personal Learning Network). My plan is to connect again with Bailey next in Cupcake Wars! 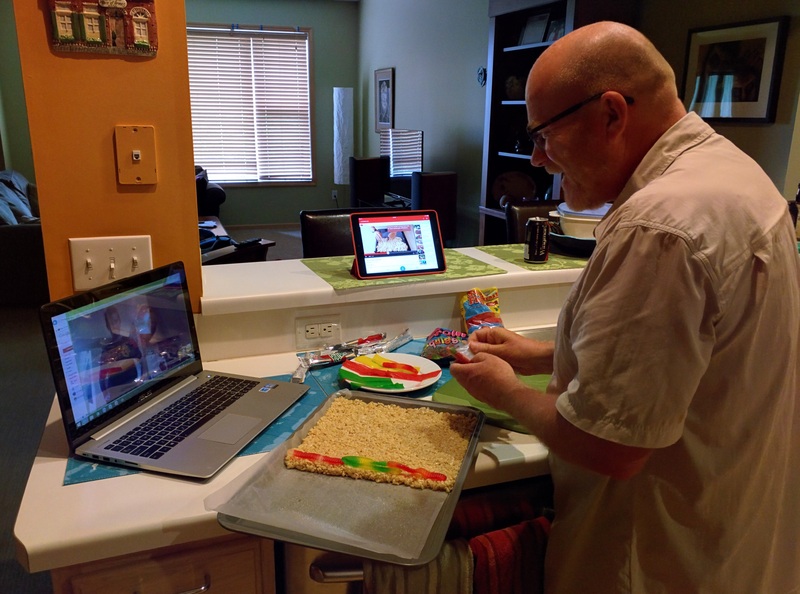 We’ll give each other a secret ingredient that has to be incorporated into the cupcakes and share our creations on GHO. After that, I want to to enhance this experience by meeting Bailey, Jon and the rest of their family in person when I am in the Washington, DC area in October and can take a side trip to where they live in eastern Maryland near the Chesapeake Bay. It’s amazing what an idea, a few ingredients and technology can create!